Release Date: March 2nd, 2007 by Paramount Pictures. The Cast: Jake Gyllenhaal, Mark Ruffalo, Anthony Edwards, Robert Downey Jr., Brian Cox, Chloë Sevigny, Elias Koteas, Dermot Mulroney, Donal Logue, Clea DuVall, Philip Baker Hall, John Carroll Lynch. 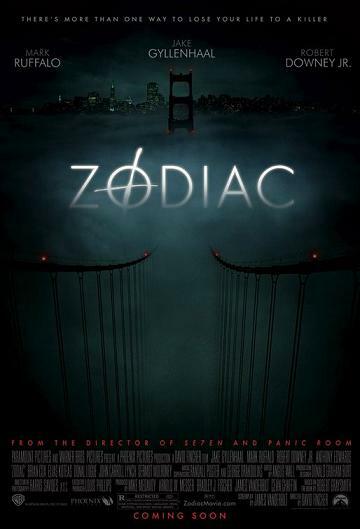 BASIC PREMISE: In the 60’s and 70’s, David (Ruffalo), a detective, Paul (Downey, Jr.), a crime reporter and Robert (Gyllenhaal), a cartoonist, hunt for a notorious serial killer known as the “Zodiac”. Based on the book of the same name by Robert Graysmith. ENTERTAINMENT VALUE: Zodiac offers no surprises for those familiar with the book or who grew up during the 60’s and 70’s when the Zodiac was all over the news, yet it still manages to be consistently gripping. Scene-stealing Robert Downey, Jr. plays Paul, a crime reporter for the San Francisco Chronicle who tries to figure out the identity of the Zodiac serial killer. This isn’t just any serial killer—he actually communicates with the media by sending threatening letters to newspaper headquarters and cryptic messages. Robert, the Chronicle’s cartoonist, thinks he can crack some of the messages and eventually befriends Paul and helps him find new clues. To add even more pressure to the investigation, detective David and his partner William (Edwards) also try to help out. The plot becomes quite fascinating when they think they found the killer and arrest him, but they don’t have enough evidence or a confession to prove with certainty that he’s the actual serial killer. Screenwriter James Vanderbilt does a superb job of including many interesting details of the detective work in a coherent way and occasionally flashes forward a few years without making you feel nauseous. Most importantly, you always grasp what David, Paul or Robert is thinking. He also blends in some well-needed moments of comic relief. The real triumph here, though, belongs to David Fincher, who also directed Seven and The Game, and, once again, shows off his masterful directorial skills. He wisely chooses not to include excessive gore and, instead, gradually builds tension through wonderful cinematography, set and costume design, and a brilliant music score. The often chilling, noirish atmosphere is reminiscent of classics such as Chinatown, Bullitt and Dirty Harry. If David Lynch were at the helm, this would have certainly been an immensely bizarre head-spinner. Despite a running time of 2 hours and 40 minutes, Zodiac never overstays its welcome. IN A NUTSHELL: A chilling, gripping and noirish thriller.